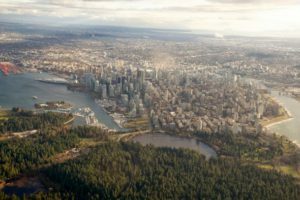 We love our waterfront here in Vancouver, the beaches, the parks, the seawall, the river — whether you’re on or off the water, there’s so much to do. But how much do we actually know about the shore? Do you know what the ships anchored in English Bay are carrying? Have you ever wondered what False Creek used to look like 100 years ago? When was the last time you took a close look at the animals that live on the shore? We at GSA think it’s time to celebrate our shoreline and all it has to offer. On October 5th, we are inviting everyone to come down to the Vancouver Maritime Museum for Water’s Edge Day and spend the day with us exploring and enjoying the shoreline as part of our Waterfront Initiative. Enjoy free access to the Vancouver Maritime Museum all day long. You can find all details and updates here. See the city from a different angle — how about from a helicopter or a zodiac? The best thing is: if you love the waterfront as much as we do, you can turn that into a great chance to win: We want you to share your favourite moments, pictures, videos, places or stories from Vancouver’s shore with us in our #MyVanWaterfront contest: Did you snap a great sunset picture at the beach? Have you been out on the water? Did you spot a cool animal on the shore? What else did you, your family and friends do on the waterfront this summer? Simply post on twitter or instagram with the hashtag #MyVanWaterfront and tag your location our submit here, and you will be entered into the draw. All submissions to the #MyVanWaterfront contest will be drawn at Water’s Edge Day. Our exciting main prize is a scenic helicopter ride for 2 from Vancouver to Victoria and back with Helijet. And you can also win a kayak paddle from Feathercraft or awesome hoodies and other merchandise from Sitka Surfboards. And there will be more prizes on Water’s Edge Day: We’re giving away 10 tickets for 2 for a waterfront sightseeing tour of Vancouver. In other words, you really don’t want to miss out on Water’s Edge Day! Read the latest from our staff and guest bloggers about our work and what's happening in the Strait.